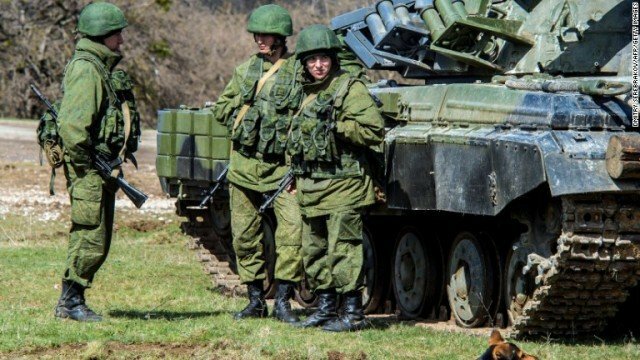 According to the German government, Russia’s President Vladimir Putin has ordered a “partial withdrawal” of troops from the border with Ukraine. Vladimir Putin informed German Chancellor Angela Merkel of the move in a telephone conversation, according to her office. Thousands of Russian soldiers are still said to be deployed along the border. Earlier, Ukraine condemned a visit to Crimea by Russia’s PM Dmitry Medvedev and a delegation of government ministers. A foreign ministry spokesman in Kiev said the highest-level trip to the Black Sea peninsula by officials from Moscow since its annexation by Russia was a “crude violation” of international rules. A note protesting against the presence of an official in “the territory of another state without preliminary agreement” had been sent, he added. Crimeans voted to leave Ukraine for Russia on March 16, in a referendum condemned as illegal by the UN General Assembly. Dmitry Medvedev announced that he would make Crimea a special economic zone, with tax breaks and reduced bureaucracy to attract investors. He also vowed to quickly boost salaries and pensions, and to improve education, healthcare and local infrastructure. Tensions between Russia and the West rose after the overthrow of pro-Kremlin Ukrainian President Viktor Yanukovych in February, following months of street protests. Russia’s subsequent decision to annex Crimea triggered a crisis in relations. A Kremlin statement did not mention a partial withdrawal, but said Vladimir Putin and Angela Merkel had discussed “opportunities for international support for the restoration of stability” in Ukraine. Vladimir Putin had also told Angela Merkel that Ukraine had to enact constitutional reforms to ensure that the interests of all its regions were respected, and called for measures to end the “blockade” of Trans-Dniester, the statement added.